At first glance Scroll Stitch does not look too exciting but it is one of those stitches where using different threads creates all sorts of interesting effects from a braid like stitch to a line of spaced knots. You can work it on a tight curve and looks good when used to define a disk. As you can see in the sample above I worked a series of scallops along a seam on a crazy quilt block. Scroll stitch can be worked back to back to produce a heavy line or even lines stacked one against the other. This is particularly successful if you use a variegated or hand dyed thread because it can produce interesting texture and appearance as the colour shifts. Scroll stitch is also known as single knotted line stitch. Work scroll stitch from left to right along the line. 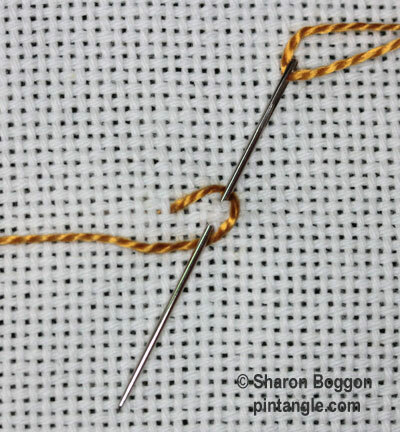 Bring your needle out of the fabric on the left, move along the line slightly and insert your needle on the line in a diagonal position pointing left taking a small bit of the fabric. 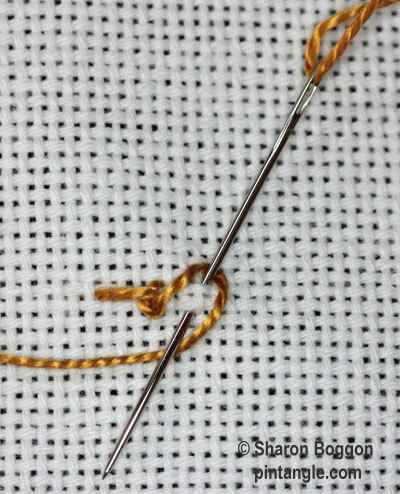 With the thread wrapped behind and under the needle, pull through the fabric. As you work along the line do not pull the loop too tightly. Novelty threads often work well with this stitch so do experiment a bit. Good evening! Another rainy day in Maryland. Here is my sample of Stitch 62. Thank you and have a great day. Hi Sharon & Friends, My post for the stitch 62. Thank you all. I hope this post has worked? My post with scroll stitch did not seem to register, I hope this link now works? I love this stitch! I look forward to using it in more blocks!